A vacation rental that is sure to please!!! 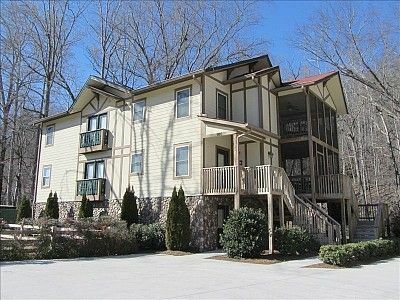 Our vacation condo is situated on the banks of the Chattahoochee River where you can relax on the screened deck and have a meal or snack while enjoying the sights and sounds of the Chattahoochee River cascading over the rocks. After relaxing a spell you may want to take a dip in the river, go next door to the festhalle for some bingo or dancing, across the street for some miniature golf, to Main St.(one block away) for a horse drawn carriage ride and some shopping, take a hike on one of the many trails close by ,or take a drive through the beautiful North Georgia Mountains. Then back to our home with amazing RIVER VIEWS from the living area, dining area, and the master bedroom. Our condo has the best location, it is walking distance to many activities and restaurants and it also provides the perfect spot for relaxation. So whether you want adventure or relaxation we have the perfect accommodation for you! The living room has a gas fireplace (Oct.- Feb.), 43'' cable TV and DVD player which you can enjoy from the leather sofa or from the dining table. The kitchen is well equipped and has granite counters and stainless appliances. The master bedroom has a gas fireplace (Oct.-Feb.), King bed, I-Home docking station clock radio, TV, and private bath with whirlpool tub, separate shower, and double sinks. The second bedroom has King bed, TV, and private bath with whirlpool tub/shower combo. It also has a half bath in the hall. Our unit has all the amenities for a great vacation so come and enjoy your stay!!!!!! The condo was beautiful and roomy. The location next to the river and it’s proximity to everything was perfect! Will definitely stay here again! Perfect location for walking to town, shops, restaurants. Beds were super comfy! Kitchen well equipped. It had all we needed for a weekend. Was too chilly to enjoy the screened porch but we’ll be back when it’s warmer. Great place! This was our second stay at Diane's property. It is immaculate, well appointed and feels like a private residence vs. a vacation rental. The location offers an easy walk to all of downtown Helen's attractions and dining. Listening to the sounds of the river while sitting in front of the gas fireplace makes for a very relaxing end to every day. You couldn’t ask for a better location. Walking distance to everywhere you want to go. Right next to the fest hall Andrew Bodensee. We rented this on a whim and, after seeing everything else in town, there is no better spot. Oh yeah, it’s also on a river which you can listen to from the spacious deck. Great property that is close to downtown Helen with the river flowing next to the screened in porch. This is an upstairs condo so may not be so great for folks with knee or leg issues. The unit is well furnished with just about anything you might need.